Amy Purdy is now a married woman. Jaymes Vaughan and James Davis talk about their The Amazing Race experience and second-place finish -- including what Jaymes is requesting fans do for his family and what little things in the Race the guys found to be "amazing." Natalie Anderson and Nadiya Anderson finish up their discussion of The Amazing Race -- including admitting which three teams they didn't like and how they respond to viewers heavily criticizing their decision to "steal." Trey Wier and Alexis "Lexi" Beerman conclude their discussion of The Amazing Race -- including whether they regret and feel guilty about taking James and Abba's money and their thoughts on fellow Racer Rob French's comment that he "lost all respect" for them. 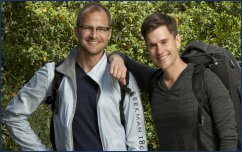 Josh Kilmer-Purcell and Brent Ridge talk more about their The Amazing Race experience -- including whether teaming up with Abbie and Ryan was really friendly or strategic and when their home court advantage didn't help them in the final leg. Jaymes Vaughan and James Davis talk about their time on The Amazing Race -- including how they felt about Josh and Brent's post-victory lip-lock and how much they had studied for that final Roadblock task. Natalie Anderson and Nadiya Anderson talk about their The Amazing Race experience and tough elimination -- including how they feel they would've done in the final leg's challenging tasks and whether they believe Josh and Brent "deserved" to win. Trey Wier and Alexis "Lexi" Beerman discuss their The Amazing Race experience and finishing in third place -- including what the real reason was behind their alliance's decision to get Abbie and Ryan out of the Race and her tears upon trying to finish the final flag Roadblock task. Josh Kilmer-Purcell and Brent Ridge talk about their time on The Amazing Race -- including what they found "most hurtful" during the Race and how far ahead they believe they finished the final leg. The Amazing Race crowned Josh Kilmer-Purcell and Brent Ridge the winners of its 21st season during Sunday night's two-hour finale broadcast of the CBS reality competition. The Amazing Race teammates Natalie Anderson and Nadiya Anderson survived to compete in the 21st-season's eleventh leg despite a last-place finish during Sunday night's broadcast of the Race's tenth leg. Abbie Ginsberg and Ryan Danz conclude their discussion of The Amazing Race -- including what was most important to Ryan in regards to competing on the Race. Abbie Ginsberg and Ryan Danz open up about their time on The Amazing Race and the obstacles they had to face after being labeled a uber-competitive and aggressive team -- including why they really wanted to race alongside Josh Kilmer-Purcell and Brent Ridge when both teams were stuck behind the rest of the pack. The Amazing Race eliminated Racers Abbie Ginsberg and Ryan Danz during Sunday night's broadcast of the CBS reality competition's 21st season. James LoMenzo and Mark "Abba" Abbattista conclude their discussion of The Amazing Race -- including whether they actually completed the Speed Bump, Roadblock and/or Detour task during the leg in which they were ousted. James LoMenzo and Mark "Abba" Abbattista talk about their time on The Amazing Race -- including what exactly went down with Abba's stolen passport and how they felt about Natalie and Nadiya Anderson's decision to steal their $100. The Amazing Race eliminated Racers James LoMenzo and Mark "Abba" Abbattista during Sunday night's broadcast of the CBS reality competition's 21st season. The Amazing Race Racers ran a strong leg and finished in first place during Sunday night's broadcast of the CBS reality competition's 21st season.